The discussion on the general circulation of the atmosphere in Chapter 2 presupposed that most of the heating of the earth's surface comes from solar radiation. The total solar energy reaching the surface of the earth each year is about 2 x 1021 kj (5 x 1020 kcal). 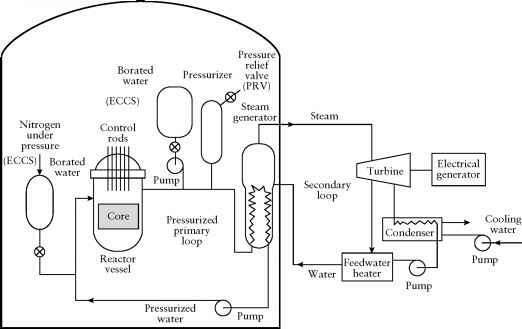 Heat generated by radioactive processes in the earth and conduction from the core contribute 8 x 1017 kj (2 x 1017 kcal), and human activities contribute about 4 x 1017 kj (1017 kcal) per year. This means that less than 0.1% of the total energy reaching the earth's surface each year comes from processes other than direct solar radiation. For the purposes of this chapter, therefore, we may treat the energy input to the earth as if it all came from the sun. where k = 1.38 x 10-23 J molecule-1 K-1 is Boltzmann's constant (the gas constant per molecule), h is Planck's constant, 6.63 x 10-34 J-s, c is the speed of light in vacuum, 3.00 x 108m/s, X is the wavelength of interest in meters, and T is the absolute temperature in kelvin. where a = 5.672 x 10-8 W m-2 K-4 = 8.22 x 10-11 cal cm-2 min-1K-4. 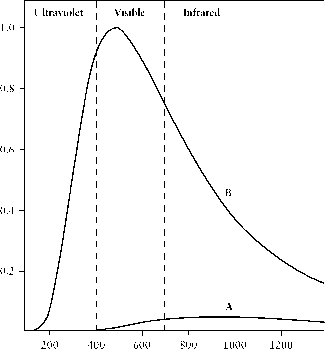 FIGURE 3-1 Distribution of energy from a blackbody radiator at 3300 K (curve A) and 6000 K (curve B). FIGURE 3-2 Comparison of earth's surface area with the area of earth's projection on a plane perpendicular to the sun's rays. Plane perpendicular to sun's rays the total amount of solar radiation coming in to the top of the earth's atmosphere; some of this radiation is absorbed in the atmosphere and some is reflected. The solar radiation that actually penetrates to the surface of the earth below the atmosphere no longer has the spectral distribution of black body radiation from a body at 6000 K (Figure 3-1). Figure 3-3 shows that no solar radiation with wavelength below 0.28 ^m (280 nm) reaches the surface of the earth. We already knew this, from the discussion of absorption by oxygen in the thermosphere and by ozone and oxygen in the stratosphere (Section 2.5). The absorption of solar infrared radiation has not been discussed yet, but a large portion of the sun's infrared radiation is absorbed by water vapor, carbon dioxide, and trace gases in the atmosphere. 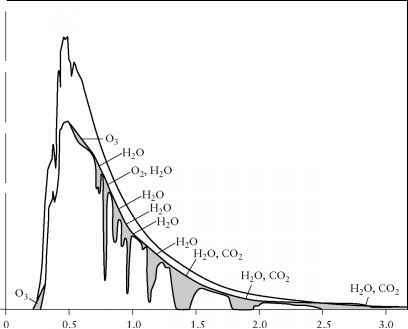 Figure 3-4 specifically shows the absorption of solar radiation by water and carbon dioxide in the atmosphere; one can see that this absorption is complete at some wavelengths. The absorption of solar infrared radiation by various constituents of the atmosphere is not very important because comparatively little of the solar radiation is in the infrared (Figures 3-1 and 3-3). These absorptions become much more important when we consider radiation emitted by the earth. It should be fairly obvious that the earth is emitting radiation because, on the average, the earth is in thermal equilibrium. It is in the path of 2 x 1021 kj of solar radiation each year, and it is necessary that 2 x 1021 kj per year leave the earth. If less energy than that leaves the earth, it will become hotter. Some of the solar energy, as we shall see, is immediately reflected, but some is absorbed and must be reemitted. FIGURE 3-3 The transmission spectrum of the upper atmosphere: low transmission means high absorption. Redrawn from J. E. Harries, Earthwatch, The Climate from Space. Horwood, New York, Copyright © 1990. FIGURE 3-4 Spectral distribution of solar irradiation at the top of the atmosphere and at sea level for average atmospheric conditions for the sun at zenith. Shaded areas represent absorption by various atmospheric gases. Unshaded area between the two curves represents the portion of the solar energy backscattered by the air, water vapor, dust, and aerosols and reflected by clouds. Redrawn from J. P. Peinuto and A. H. Oort, Physics of Climate. American Institute of Physics, New York. Copyright © 1992 by Springer-Verlag GmbH & Co. Used by permission of the publisher.